This post begins my annual film-by-film look at the upcoming Sundance Film Festival, kicking off with the 2014 US Documentary Competition. Up first alphabetically: ALIVE INSIDE: A STORY OF MUSIC & MEMORY, Michael Rossato-Bennett’s exploration of the power of music to awaken sufferers of dementia and Alzheimer’s. As dementia continues to affect millions of elderly Americans, ALIVE INSIDE: A STORY OF MUSIC & MEMORY reveals a remarkable, music-based breakthrough that has already transformed lives. 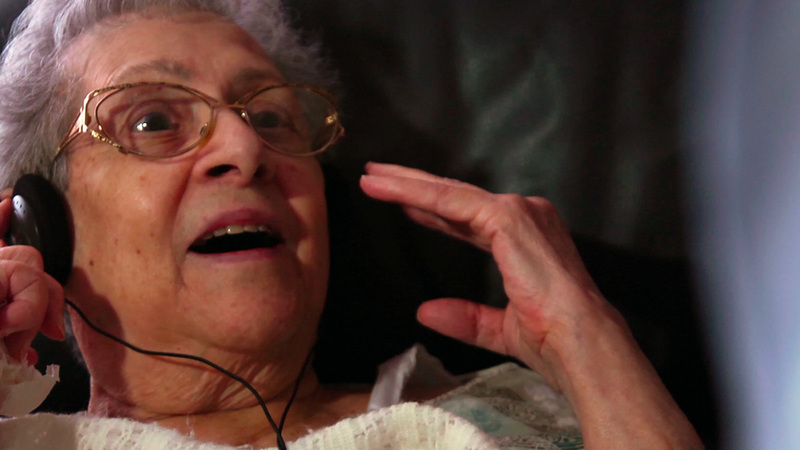 Spearheaded by social worker Dan Cohen and captured on camera over the course of three years by filmmaker Michael Rossato-Bennett, we learn that songs from a patient’s past can awaken memories and emotions that have been asleep for years, sometimes decades. Within a moment of hearing “I Get Around” by the Beach Boys, Alzheimer’s patient Marylou jolts back to life, dancing around the living room and expressing a euphoria her husband hasn’t witnessed since her illness took effect. Countless instances in ALIVE INSIDE provide proof that music stimulates activity in dementia-affected parts of the brain and transforms the quality of life of those often left to languish in silence. This marks director/producer Rossato-Bennett’s return to feature filmmaking after some initial hour-long projects in the early 1980s, which he followed with a successful career focused on travel photography. Credited as one of the film’s executive producers is the Shelley & Donald Rubin Foundation, whose philanthropy also supported the work of Dan Cohen’s Music and Memory organization, the inspiration for the project. Readers may be familiar with the subject, as a preliminary clip from the film went viral early last year. As our senior population continues to grow, more and more of us will be confronting the challenges of caring for our elderly loved ones, with many of them also sadly facing symptoms like dementia. Cohen’s simple intervention, as shown in Rossato-Bennett’s emotionally affecting film, offers a way to mitigate some of the impact. On a broader level, the consideration the film gives to our culture’s institutionalization of aging and disease offers serious food for thought, prompting a larger scale re-evaluation of best practices in the nursing home industry as well as of our personal relationships with the elderly within our own families. To keep updated on the doc, check out its website and Facebook page. Check out Rossato-Bennett’s Meet the Artist Sundance video profile. As it becomes available, I’ll also link to his Indiewire filmmaker interview. For screening dates and times at Sundance, click the link in the first paragraph.